I absolutely loved reading this one from Hypnobirthing mum and dad Sarah & Mark who did a private workshop with me to prepare for the birth of their baby. 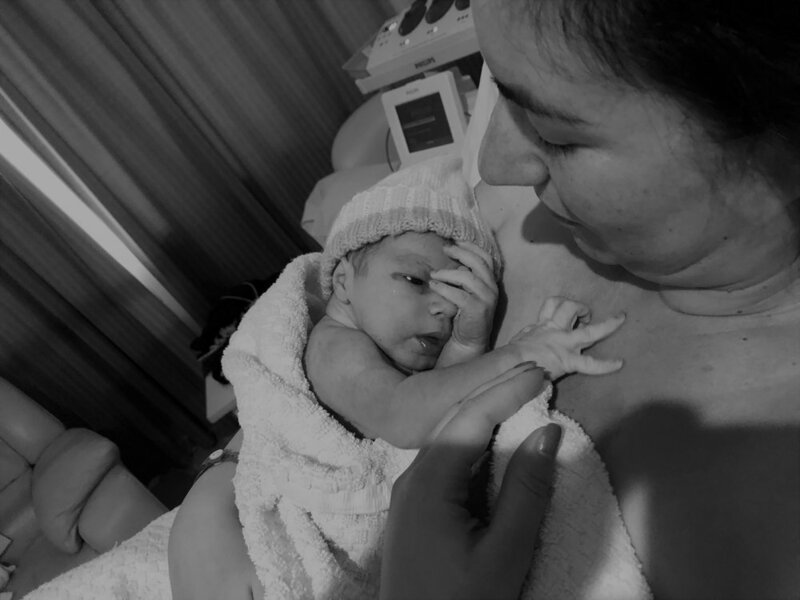 I loved sharing the Hypnobirthing Australia™ course with them and I am so blessed to have permission to share their beautiful birth story with you…enjoy! Bringing Alfonso into the world was the most empowering experience and one that I remember so clearly and will never forget. Mark and I were so present in the moment and as a team we birthed our strong little boy, who in the end, was in a hurry to come out. It was definitely an act of nature, both Alfonso and my body working together and both knowing what to do. It all began early Friday morning at 1:00 am. I was reluctant to wake my husband as I wasn’t quite sure if I was in labour, however as the surges grew more intense, I thought to myself it’s time to put our “hypno skills” into action. My husband got the exercise ball and started using the light touch massage, whilst also timing the surges on an app. After 5 minutes, I was timing as a minute on/ a minute off and the app encouraged us to go to hospital. We continued to breath through the surges and in between ask each other, is it suppose to be like this? Shouldn’t you have more time between surges? Are you in labour? We decided to ring the hospital and they advised us to take some Panadol and see if the ‘pain’ settles. We both decided that we would continue to breathe through the surges and rely on pressure points as I did not want any interference, including Panadol (as I was advised by my hypnobirthing coach that it may slow down the natural process). Approximately an hour later I said to my husband that it is time to go to the hospital. I personally wasn’t feeling safe at home and the surges were not slowing down, continuing to be a minute on, a minute off. I remember saying to Mark, once I’m at the hospital I can relax and focus on our strategies. When we arrived at the hospital I was continuously apologising to the midwife, saying, “I don’t want to waste your time, I’m happy to go home, I just want to make sure the baby is ok, I’m not sure if I’m in labour, My waters haven’t broken”. At this stage I was feeling a little overwhelmed and so unsure, as it wasn’t what I was expecting. The midwife turned to me and said, “oh sweetheart, you are in labour”. Hearing those words, I felt so relieved. I knew what was happening to my body and I could now focus on my breathing and Mark could implement everything he had been practicing. The Midwives were all aware of my birthing plan and from the beginning, extremely supportive. At 2cm dilated the midwife asked if I wanted to hop in the bath. Personally, I am not a water person. I always avoid the beach and pool and definitely do not bath. However, towards the end of my pregnancy there was nothing more relaxing then having a bath and listening to my hypnobirthing tracks. In the final weeks I downloaded the “Baby Come Out” track and found myself listening to this track at least twice a day. I hoped in the bath at around 2:30am and stayed there until my obstetrician came to see me in the morning at 10:00am. My contractions continued a minute on/ a minute off. Mark continued to assist by using pressure points and light touch massage on my head and upper back. When I experienced a surge Mark would hold my hand and encourage me to breathe, he continuously made sure that my ‘out breath’ was longer then my ‘in breath’. I had all hypnobirthing tracks on repeat, which assisted me in staying calm and focusing on my baby. I continuously told myself, “this is about the baby”. When the obstetrician arrived, he did an internal and said I was 4cm dilated. At this point he suggested breaking the waters. He explained that I can continue as I am and baby will probably arrive late evening or early morning. Or if we break the waters, Baby should be here by the afternoon. He was aware that we were hypnobirthing our baby and were reluctant to have any interference, so he left us to discuss our options. Mark and I talked it through and I remember saying to him, I don’t think I can do this for another 10 hours or more. So we decided to break the waters. By this point I must have been transitioning because I remember grabbing on to Mark’s neck and saying I don’t think I can do this for much longer. Now I really felt the urge to push and the more I fought against it, the more intense the surges were. At this point I asked for some happy gas. The midwife ended up calling for the obstetrician, as my heart rate was still low and more importantly so was Alfonso’s. This all occurred 45minutes after my waters were broken. The obstetrician arrived and within seconds the room was filled with medical staff. I was told that I was 10cm dilated and it was all on me. He said that he will use the ventouse to assist me but we need to get the baby out. After the first two pushes Alfonso’s head was out and I was told to stop, as the umbilical cord was around his neck. The obstetrician quickly corrected this and within two more surges Alfonso had arrived. The first hour with Alfonso was perfect, we did skin on skin and Alfonso managed to latch on (he hasn’t stopped eating since!) and we were able to have delayed cord clamping. Once the cord was cut, the obstetrician commented on the large size of my placenta and said my umbilical cord was abnormally long. Suggesting Alfonso was extremely active. He said your baby will be “go, go, go, the life of the party and then he will just crash”. To be honest, that is the perfect description of our little man. The last 45 minutes went so quickly and despite being told to lay down, have my legs held apart and needing oxygen, I still felt so calm and in control. I never once doubted myself, it was like I knew it would end up this way but we will both be ok. I think it was scarier for Mark because so much happened and so many people were surrounding us in such a short amount of time. In the end it was the most amazing experience and I truly love telling people my birth story. 2 hours later I was already showered and excited to share my son with all our family and friends. My recovery was amazing, I barely tore and had one stitch to help the healing process. I put this down to viewing my body as ‘lotus flower’. When beginning our hypnobirthing journey, we were both a little hesitant, but honestly it gave us the skills we needed to give our little man the start we wanted. He is our little blessing and we are so glad that he chose us! Written by Sarah Tirimacco and shared with permission.